It’s likely your child will contract chicken pox at some point during his childhood, especially as he enters preschool or nursery programs and begins interacting with other children. Learning how to recognize the signs and symptoms and helping him recover from the ailments will help protect both his health and his comfort level. 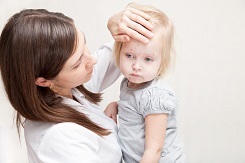 Chicken pox, a common virus called Varicella, often begins with a few red spots or bumps that resemble and can be mistaken for insect bites, states Dr. Williams Sears, pediatrician and founder of Ask Dr. Sears. Fever is also a common symptom. By day 7, all of the blisters will crust over and the fever should subside. The total of number spots is 200 on average, according to Sears. It may be difficult to determine how your child contracted chicken pox, but the health experts at Nemours KidsHealth say the virus can spread through the air by coughing and sneezing and with direct contact from mucus, saliva or fluid from blisters. Even before your child develops red spots or bumps, he is contagious. Chicken pox is contagious two days before a rash or bumps even appear and until all blisters have dried, which typically takes a week, according to the experts at Nemours. Although it may be difficult to diagnose your child with chicken pox during the first few days, it is a good idea to quarantine him until you have a diagnosis from his pediatrician. An infant 2 months or younger catches chickenpox. Your child has a weakened immune system, such as from an immune disorder or from taking steroid medication. Your child has a fever for more than five days. Severe headaches develop, even when fever is controlled (high fever can cause headaches, which is not worrisome). Severe headaches with vomiting and stiff, painful back of the neck or spine occur. Any spots become infected, with redness spreading outward from the spot and puss draining out. When your child has contracted chicken pox, it is only possible to treat the symptoms and make him as comfortable as possible. Itching is one of the most prominent side effects of this ailment, so your child, especially at the toddler age, may have difficulty resisting the urge to itch the pox. Keeping your little one occupied can also distract him from the itching. Get creative with games, coloring books and art projects that will keep him entertained yet comfortable while recovering from the chicken pox. If your child is suffering from a fever, he may feel comforted by stories or a book. According to Dr. Sears, parents or nannies can use Tylenol or ibuprofen to treat the fever, but it is imperative that you avoid treating with aspirin during a chicken pox infection. If your child’s fever is below 101 and he is feeling comfortable, it may not be necessary to even treat the fever as his immune system fights off the infection. If you attempt to open the closet in your child’s room and a nightmare ensues, with clothes strewn sloppily on hangers, toys scattered on the floor and shoes mismatched throughout, it may be time for a makeover. As a nanny or parent, you know that teaching children how to organize and keep their things tidy leads to less clutter, but they may need a creative push to motivate them to free the disorder and mess from their lives and their closets. 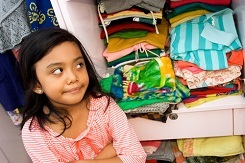 Designing and organizing a kid’s closet doesn’t have to be a pain, either. By considering the adjustability and accessibility of how you can creatively organize, the clutter will soon disappear. It’s natural to want your child to become self-sufficient by encouraging him to do things like dress himself and select his clothes and shoes for the day, but a disorganized closet that is not kid-friendly could significantly impair these efforts. Consider the design of the closet when launching your child’s closet makeover, says Alla Akimova, interior designer at Archives id in New York. Since your child is growing, you should adjust the closet rods to the appropriate height and use adjustable shelves so he can access his clothing easily. Using adjustable shelves that can be moved as your child grows will save you time and money in the long run. “For the small kids, a little step stool will help them to become independent,” says Akimova. The middle of the closet is the ideal space for shelves and rods to add more surface space for mixed size clothes to hang and to neatly store folded clothes. Utilize the top shelves for items that are seasonal or for extra shoe boxes your child will not need to access on a regular basis. Many closets are often built deep. Use every inch for a perfectly organized kid’s closet. If you have enough space, Akimova recommends storing large scale flat objects and large toys that your child does not use regularly in the recesses of the closet. Put a rod closer to the front of the closet and hang clothes on it to conceal these large objects. Even though your child’s closet door is typically closed, you want the space to be appealing and welcoming. Dress up the hardware to fit your child’s personality. Themed hardware inspired by your child’s favorite characters can be added to drawers and shelves. “I prefer to use single knobs opposite to a pull because it is easier to replace ‘Elmo’ knobs to a more age-appropriate hardware in the future,” says Akimova. Finding durable hardware and construction materials to use in a closet will also help extend the shelf life. Sturdy compartment dividers offer a sense of order, dividing sweaters from jeans and tennis shoes from sandals. Durable plywood is also a much more cost-effective choice versus particle board, says Akimova. Particle board is sensitive to water in case of spills and is not durable for the long-term, she says. Plywood, a sturdier material to construct shelves with, can be painted and even purchased pre-finished. “It will last a lot longer and has less off gas, thus making a child’s environment healthier,” says Akimova. Falling hazards should also be a consideration. Akimova recommends against rod brackets where the bar could be lifted up and possibly fall on your child. Glass is a no-no, too. “Naturally, we would never use real glass anywhere in a small child’s room,” she says. It’s difficult to watch your child tense in fear when it’s time for vaccinations or routine shots at the doctor’s office. In fact, nannies and parents often feel helpless as their children cry and squirm at the sight of a needle. There are ways you can help to ease your child’s fear of shots, though, both before you enter the doctor’s office and once you’re in the examination room. All you need are some creative strategies. The key to helping your child cope with the fear of getting shots is to prep him before you even leave your home. Begin by talking with your child about why vaccinations and routine shots are important. Stress the health benefits of preventing diseases by using calm, age-appropriate language. Phrases such as “we don’t want your tummy to hurt, so we are going to get medicine to help you” and “we want you to always feel good, so we get shots to keep the germs away” can help your child identify with why shots are necessary. When scheduling vaccination appointments, it’s also important to avoid surprising your child when you get to the doctor’s office. Let your child know the day of the appointment that it is time to check in with the doctor to see how much he has grown and to help ward off the germs. To help ease his worries, make the appointment for early in the morning, so he does not have anxiety and fear throughout the day. 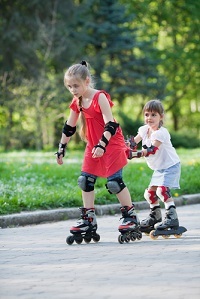 According to Madeline Vann, health and medical expert with Everyday Health, another advantage to scheduling early is that there will be time during the day for your child to be active and work off any soreness stemming from the shots. 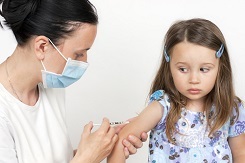 As you get your child used to the idea of visiting the doctor for shots, avoid white lies. “Everyone, even small children, know shots hurt a bit, so there’s no point in pretending otherwise,” says Zak Zarbock, Utah-based pediatrician. Even though you may have a fear of needles or shots, too, it’s best to avoid expressing your emotions and fears in front of your child. Instead, if you need to look away, go ahead, but make sure you are comforting your child and holding his hand at the same time. If you need moral support, bring along another adult or spouse to increase both yours and your child’s comfort level. Comfort is key when easing your child’s fears about shots. Allow your little one to hold on tight to his favorite stuffed animal or toy when he is sitting in the examination room. A distraction will also help. Possibly give your child a small treat, such as a lollipop, to distract him from the needle approaching his arm. Just make sure that you avoid any type of food or beverage that could cause him to choke if he does begin to cry. Making your child laugh or smile is a welcome sight during vaccinations. You can tell a silly story, sing a song or use funny voices to take his mind off of the vaccinations. Point out a cute picture or character on the wall to divert his eyes from the needle or ask him to sing the ABC’s with you as the nurse prepares his shots. As long as your child knows that the shots will be over quickly, it may be easier to bear. When scheduling vaccinations, do your best to schedule as many as possible in one visit so your child does not face the anxiety or fear too often. It is likely your child will remember the fear he felt before getting the shots – even if it proved to be painless. Praise his courage by offering a fun reward. 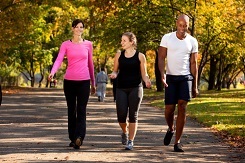 For example, you can let him know that if he is cooperative during the doctor’s visit, then the two of you can embark on a journey to the park or celebrate with a special lunch. “It’s fine to incentivize a little bit, to offer a reward or treat afterwards,” says Zarbock. In fact, he allows children to choose a special prize after vaccinations in his practice. Even with the best training, there may come a time when a nanny is stumped on how to help a child, discipline him or keep him entertained. Luckily, parenting books offer a rich variety of tips and strategies that can keep your household or the one you work for running smoothly. Beyond browsing the family and parenting section of your local bookstore or library, check out these books that offer advice on discipline and more. America’s Nanny offers a large dose of healthy parenting advice with secrets for raising happy, secure, and well-balanced babies and toddlers. Babies don’t come with instructions, unfortunately, and many of today’s parents find themselves overwhelmed with schedules and demands, with little time to bone up on their parenting skills. Often removed from grandparents and relatives, who lived next door or just down the street in times past, they have no one to guide them through the disorienting world of raising children. Enter Nanny to the Rescue! Michelle LaRowe, 2004 International Nanny Association “Nanny of the Year,” gives her tried and true solutions to childcare. Her expertise, with chapters titled “Who’s the boss?” and “Discipline is not a four letter word”, gives confidence to parents who need specific ideas for real day-to-day problems. A proud member of Christian Nannies, Michelle also offers foundational truths that are sure to help encourage moms and dads. Regain control of your children with simple, direct, nanny-tested measures. Is your life chaotic? Are your kids running the show? Do you feel like you’re more of a zookeeper than a parent? Take heart, America. When your family’s in trouble, Nanny 911 is there on the double. Brats are not born, they’re made, and no one knows that better than Deborah Carroll and Stella Reid—Nanny Deb and Nanny Stella—the stars of the overnight hit television show on the Fox network. Each week, up to 10 million viewers tune in to see the nannies take charge and transform one family’s utter chaos into serenity. No matter how loud the tantrums or how clueless the parents, Nanny Deb and Nanny Stella help them become the families they always wanted to be. Now the nannies share their remarkable wisdom with millions of overwhelmed parents who are desperate for foolproof parenting advice at their fingertips. They’ll show that parents need to change their behavior first—because when there are no consequences for naughty behavior, kids quickly realize there’s no reason for the naughtiness to stop. And when mom and dad just don’t know what to do, the kids take over. You’ll learn how to confront problems head-on by using firm but loving discipline, effective communication, and the implementation of clear House Rules. The Best Nanny Handbook, written by Emma Kensington, covers all aspects of being a nanny. Complete childcare, communicating with parents, salaries, taxes, live-in situations and everything else you need to know about being a nanny is in this book. This handbook is a great reference for nannies and an excellent source of information for people who are thinking about becoming a nanny. Every nanny should read it cover to cover and keep it close by. Jo Frost, a.k.a “Supernanny,” is the answer to every stressed parent’s problems. In ABC’s primetime series, Jo works miracles on difficult children by dispensing no-nonsense rules and reassuring us that parents really do know best. The Supernanny method gives parents the know-how to tackle any problem area, be it mealtime, bathtime, bedtime, bedwetting, homework, sibling rivalry, aggressive behavior, or a child who just won’t do what he or she is told. In an era where parents are bombarded with conflicting or guilt-laden messages at every turn and sometimes obey their kids’ commands rather than the other way around, this is an upbeat, back-to-basics approach to restoring harmony and authority in the home. Awaiting the arrival of a little one can be filled with mixed emotions. While you may be overjoyed that your family will be expanding, you may also be feeling nervous or scared about how to care for a new baby. Preparing for a baby involves preparing your home, your family and your self for the changes that will occur. Most of all, knowing what to expect can minimize those trial and error moments of parenthood. Preparing your home for a new baby is critical to ensure you have all of the products and supplies an infant needs. In addition, you will need clothing that is appropriate for the weather in your area, a crib, and basic decorating materials and accessories to brighten up your baby’s room. Parents and nannies should be ready for sleepless nights, busy days filled with washing bottles, breastfeeding equipment and clothes, feeding and pamper changing at least every two hours, several baths and sponge baths to clean the overflowing diapers and spit up that will inevitably leak onto areas of the baby’s body, says Eldridge. More than anything, your new baby will need a lot of love and attention, says Brandi Jordan, newborn care educator and lactation consultant with The Cradle Company. As a parent or nanny, it can be exhausting to wrestle with your child’s unwillingness to take responsibility. If strewn socks on the floor, unmade beds and crumbs left on the kitchen counter are any indication that your child is not taking responsibility for his or her messes, it may be time to incorporate lessons about how to respect others by learning about responsibility. Fortunately, responsibility is a skill that can be learned. You can teach your child tips with fun, everyday activities to impress the need to be accountable for actions in life. One of the best ways to teach your children responsibility is to provide them with opportunities. Assign or delegate a task each week that your child is responsible for completing, such as taking out the trash, retrieving the mail or walking the dog. It is important to first discuss your child’s preferences, allow him or her to choose one preferable task, and then assign another. In return, your child may eagerly jump into the role because you have shown trust in her to succeed with the task. In addition, let your child know that you are proud of him and respect him for keeping his word, suggests Steele. “Once you establish a relationship with your child in which you respect him and trust him, he will feel a deep desire to keep that trust and respect,” she says.